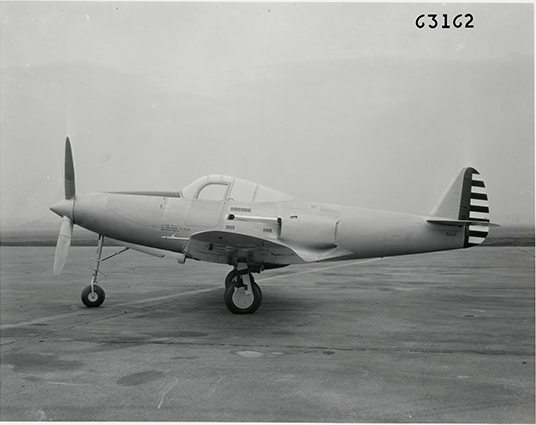 6 April 1938:¹ After being shipped by truck from the Bell Aircraft Company factory at Buffalo, New York, the XP-39 prototype, 38-326, made its first flight at Wright Field, Ohio, with test pilot James Taylor ² in the cockpit. During the test flight, Taylor flew the XP-39 to 390 miles per hour (628 kilometers per hour) at 20,000 feet (6,096 meters). The service ceiling was 32,000 feet (9,754 meters). 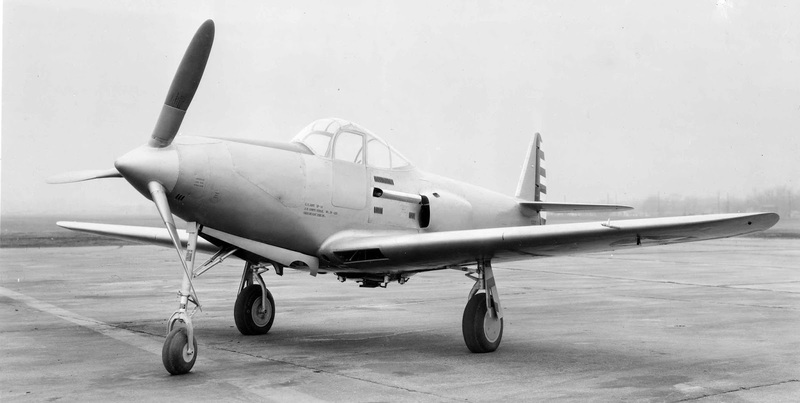 The Bell XP-39 Airacobra was a single-place, single-engine prototype fighter with a low wing and retractable tricycle landing gears. 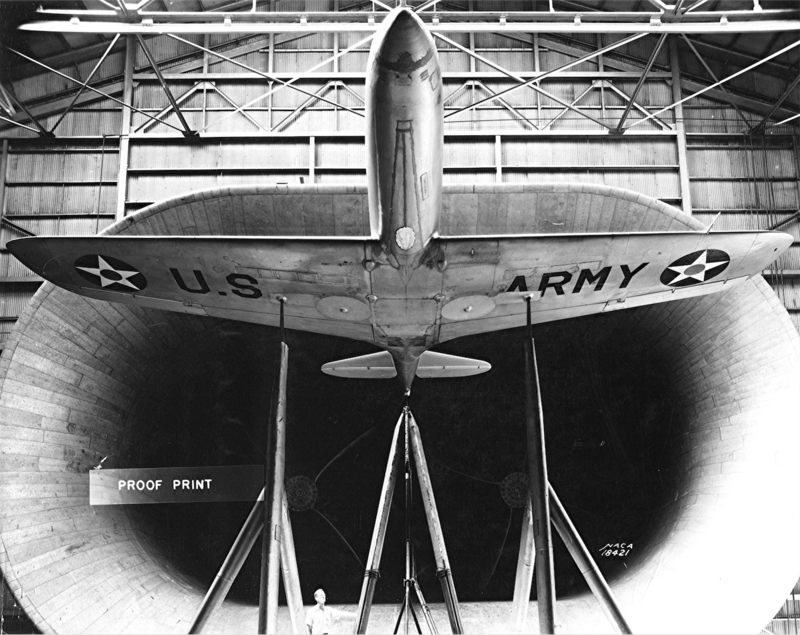 The airplane was primarily built of aluminum, though control surfaces were fabric covered. 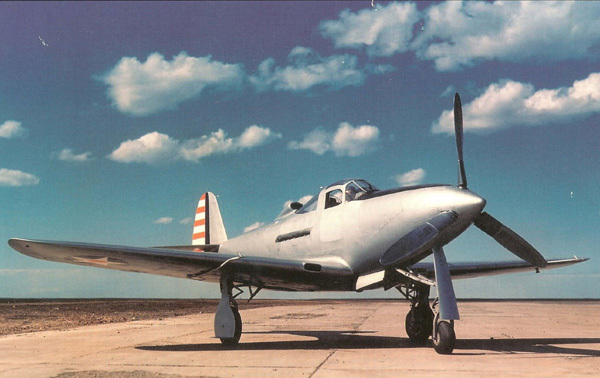 As originally built, the XP-39 was 28 feet, 8 inches (8.738 meters) long with a wingspan of 35 feet, 10 inches (10.922 meters). The prototype had an empty weight of 3,995 pounds (1,812 kilograms) and gross weight of 5,550 pounds (2,517 kilograms). 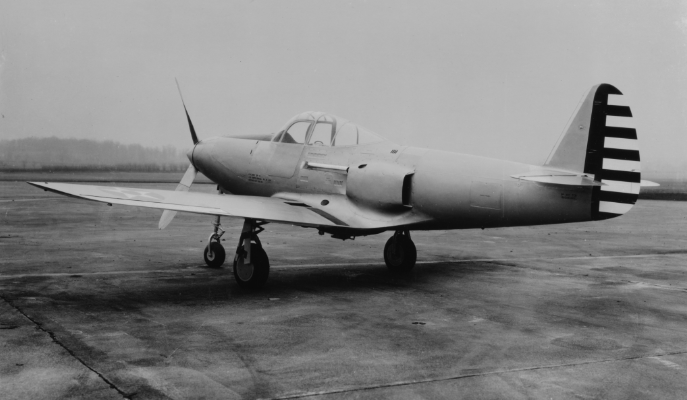 The XP-39 was unarmed, but it had been designed around the American Armament Corporation T9 37 mm autocannon, later designated Gun, Automatic, 37 mm, M4 (Aircraft).³ The cannon and ammunition were in the forward fuselage, above the engine driveshaft. The gun fired through the reduction gear box and propeller hub. 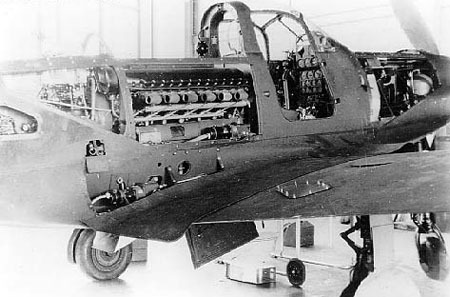 The XP-39 was originally powered by a liquid-cooled, turbosupercharged and supercharged 1,710.597-cubic-inch-displacement (28.032 liter) Allison Engineering Co. V-1710-E2 (V-1710-17), a single overhead cam (SOHC) 60° V-12 engine with a compression ratio of 6.65:1. The V-1710-17 had a Maximum Continuous Power rating of 1,000 horsepower at 2,600 r.p.m. at 25,000 feet (7,620 meters), and Takeoff/Military Power rating of 1,150 horsepower at 3,000 r.p.m. at 25,000 feet, burning 91 octane gasoline. The engine was installed in an unusual configuration behind the cockpit, with a two-piece drive shaft passing under the cockpit and turning the three-bladed Curtiss Electric constant-speed propeller through a remotely-mounted 1.8:1 gear reduction gear box. The V-1710-17 was 16 feet, 1.79 inches (4.922 meters) long, including the drive shaft and remote gear box. It was 2 feet, 11.45 inches (0.900 meters) high, 2 feet, 5.28 inches (0.744 meters) wide and weighed 1,350 pounds (612 kilograms). 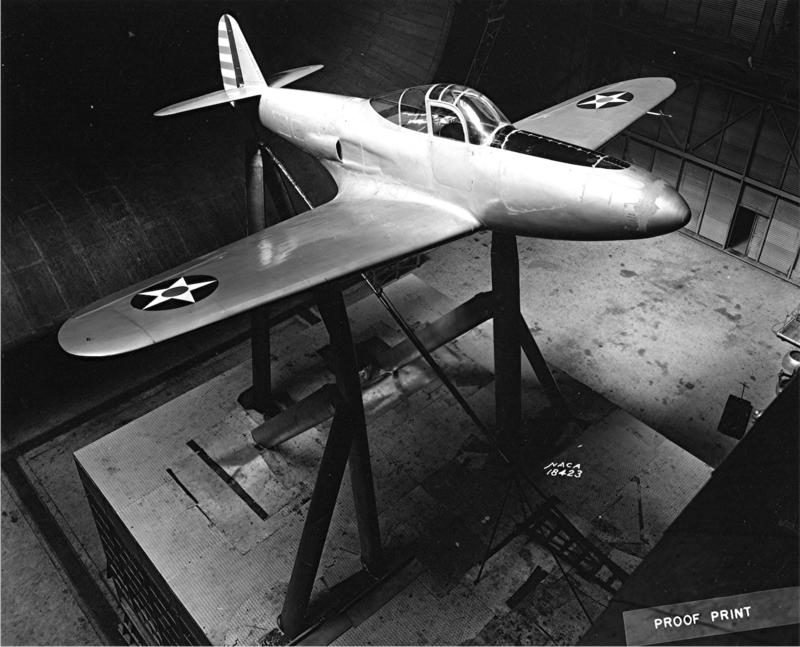 After initial flight testing, the XP-39 was sent to the National Advisory Committee for Aeronautics (NACA) Langley memorial Aeronautical Laboratory at Hampton, Virginia. 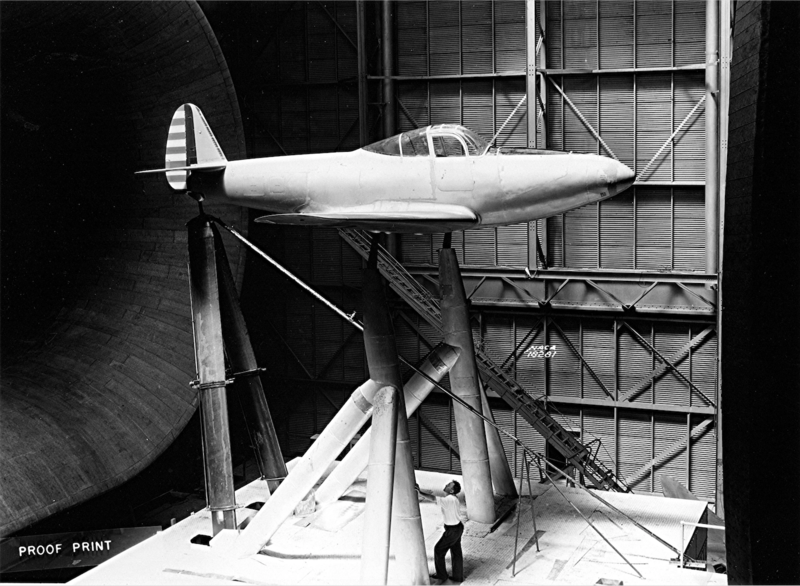 The prototype was tested in the Full-Scale Wind Tunnel. Improvements in aerodynamics were recommended and Bell rebuilt the airplane as the XP-39B with an Allison V-1710-E5 (V-1710-37) engine. The turbosupercharger had been removed, which reduced the airplane’s power at altitudes above 15,000 feet (4,572 meters). The V-1710-37 had a maximum power of 1,090 horsepower at 3,000 r.p.m. at 13,300 feet (4,054 meters). This resulted in the P-39 being used primarily as a ground-attack weapon. The XP-39B, with test pilot George Price in the cockpit, was damaged when when its landing gear did not fully extend, 6 January 1940. It was repaired and test flights resumed. On 6 August 1940, Captain Ernest K. Warburton stalled the prototype on landing. The impact resulted in significant structural damage, beyond economic repair. The airplane was later scrapped. 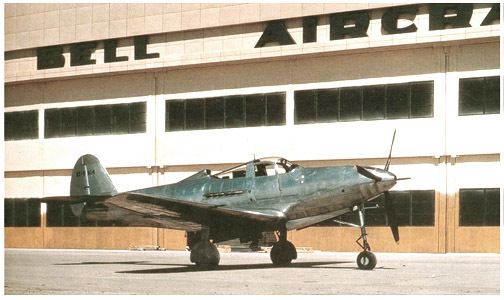 9,584 Bell P-39 Airacobras were built during World War II. More than half were sent to the Soviet Union. ¹ Reliable sources indicate the date of the first flight as both 1938 and 1939. The Bell Helicopter Company web site, “The History of Bell Helicopter: 1935–1949” states 1938. 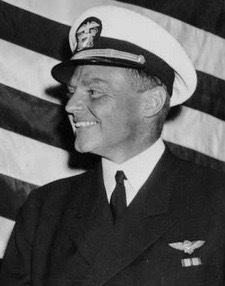 LCDR James B. Taylor, Jr., U.S.N. ² James Taylor may have been Lieutenant Commander James Blackstone Taylor, Jr., (1897–1942), Naval Aviator No. 437, a well-known U.S. Navy test pilot. ³ The 37-mm Aircraft Gun Matériel M4 is a recoil-operated aircraft weapon designed by John M. Browning. It has an overall length of 7 feet, 5 inches (2.26 meters). The barrel, or “tube,” is 5 feet, 5 inches (1.65 meters) long with a caliber of 1.457 inches (37.0 millimeters) and weighs 55 pounds (25 kilograms). The barrel is part of the recoiling section of the gun and moves rearward 9-5/8 inches (245 millimeters). The weight of the gun with a loaded 30-round magazine is 306.4 pounds (138.98 kilograms). The M4 fires a high-explosive tracer round with a muzzle velocity of 2,000 feet per second (607 meters per second). Each M54 shell is 9.75 inches (248 millimeters) long and weighs 1.93 pounds, of which the projectile makes up 1.34 pounds (0.608 kilograms). The cannon has a cyclic rate of fire of 125–150 rounds per minute.